You may need something to bring out your beauty in the crowd. Now there is no need for you to search for it in a sea of products, for this pair of earrings can exactly shoot your heart. So graceful and elegant a pair of earrings it is, bringing you more than just beauty but also gentleness and elegance. 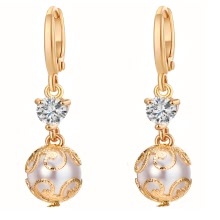 A simulated pearl dangle, very eye-catching. Also has a shining zircon, very delicate and exquisite. Classic and fashionable design, showing your good taste.